Red Hot Chili Peppers have released the newest song in the set of 18 new singles they are releasing. These singles are released via their website to fans. The new track is titled “In Love Dying”. It is eight minutes long and now available for download. To hear the new single, visit: http://www.nme.com/news/red-hot-chili-peppers/68489. 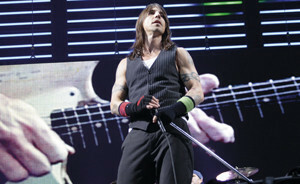 Red Hot Chili Peppers are going to headline this year’s Coachella Festival, alongside Phoenix and Blur. This event will take place in California. The Who have released details regarding a 10-date UK and Ireland arena tour. They will completely perform their album Quadrophenia in this tour, along with other classics. The tour starts in Dublin on June 8th and ends in Liverpool on June 30th. Tickets for these dates go on sale February 1st at 9am. The list of tour dates that The Who will play is: Dublin The O2 (June 8th), Belfast Odyssey (June 10th), Glasgow SECC (June 12th), London The O2 (June 15th), Sheffield Motorpoint Arena (June 18th), Newcastle metro Arena (June 20th), Manchester Arena (June 23rd), Cardiff Motorpoint Arena (June 25th), Birmingham LG Arena (June 28th), and Liverpool Echo Arena (June 30th). Muse have announced that they have already started plans for their next studio album. Muse have released their sixth studio album The 2nd Law last September and they are already planning for their seventh. Despite having early plans for the album, the band have said that it will be some time before a new album surfaces. Muse have also revealed that they will perform their song “Supremacy” at this year’s Brit Awards, with a full orchestra. They will also do a four-date stadium tour this summer in the UK. This tour starts with shows at Coventry’s Ricoh Arena on May 22nd, London’s Emirates Stadium on May 25th and 26th, and it ends at Manchester’s Etihad Stadium on June 1st. For ticket availability, be sure to visit: http://www.nme.com/tickets. Two Door Cinema Club are one of the first acts that were announced to perform for this year’s BBC Radio 1 Big Weekend. This annual and free nusic event is to take place from May 24th-26th. It will be held in Londonderry, Northern Ireland. Olly Murs has been announced to perform at the event, as well. Headline artists and a full line-up is still to be confirmed. For more information on this event, visit: http://www.bbc.co.uk/newsbeat/21246595. Two Door Cinema Club are now touring the UK with dates in Edinburgh and Wolverhampton. They will also play London’s Alexandra Palace on April 27th. To check for the availibility of tickets for these shows, visit: http://nme.seetickets.com/Tour/two-door-cinema-club?src=id1nmestory. Green Day, Biffy Clyro, Tame Impala, Django Django are acts that have been added to this year’s Optimus Alive Festival line-up, which will take place in Oeiras, Portugal. The previously announced headliners for the event include of Kings of Leon and Depeche Mode. Other new acts that have been added include Alt-J, Editors, Twin Shadow, and Of Monsters and Men. This festival will take place from July 12th to July 14th and tickets have already been made available. The Strokes have confirmed that they have a new album set to be released on March 25th, called Comedown Machine. The Stroke’s record label, Rough Trade Records, confirmed that the new album will be released in March and that it will include a new single called “All the Time”. Last week, The Strokes had a song called “One Way Trigger” on their official website available to be heard. Be sure to check out: http://www.thestrokes.com/us/onewaytrigger, to hear the new song. It has been said that Daft Punk have left EMI and are now signed to Sony/Columbia for their forthcoming fourth album. Daft Punk are currently in the process of finalizing their contract with Sony/Columbia, for their upcoming album’s release for this spring. Although little else is known about the new album, the duo are definitely set for a new release in 2013. Dirty South has announced that a new full length studio album will be released on March 5th. Dragan had announced that his new album will be called Speed of Life at an exclusive listening party and this caused a social media buzz. Those that did attend the listening party had only good words for Dragan’s latest material. Miley Cyrus has announced that she has recently signed a deal with RCA Records for her new album. The album is set to be released sometime in 2013 and remains untitled. Cyrus has said that she will be working with Dr. Luke for this follow-up album. This marks her first album release without Disney backing her. Pharrell Williams, Hit-Boy and Da Internz, and Tyler, the Creator are other people Cyrus has said to be working with. Lady Antebellum have debuted their new single “Downtown” on The Tonight Show with Jay Leno. They have also spent some time shooting the video for the new single. “Downtown” has been Lady Antebellum’s highest charting debut to date. The single landed at No. 25 on the Billboard Country Chart. THE MONSTER is climbing the Billboard!